What used to be a concept is now a reality, the Dyson Air Multiplier Fans will be available for on the shelf pretty soon! Dyson Air Multiplier Fans consists of three models, dubbed as AM01, AM02, AM03. 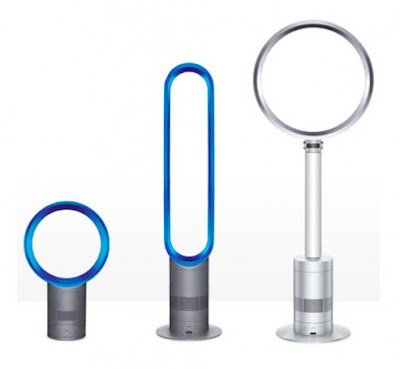 Dyson AM01 is a desktop model, Dyson AM02 is a floor-standing Tower Fan with full-length air pushing abilities, and the last model is dubbed Dyson AM03 Pedestal Fan, which is a combo design taking the head unit from the AM01 and puts it on a free-standing mount. Dyson Air Multiplier is using a totally difference concept from those conventional fans. They use Air Multiplier technology to draw in the air and amplify it up to 18 times, generating an uninterrupted stream of smooth air. Dyson Air Multiplier Fans has no blades or grill, it is easy to clean, safe and will not cause any unpleasant noise while operating. Both the AM02 and the AM03 comes with a remote controls for ease of usage. AM02 avaialble in silver or blue colors while AM03 comes in white or silver color options. No word on availability yet.